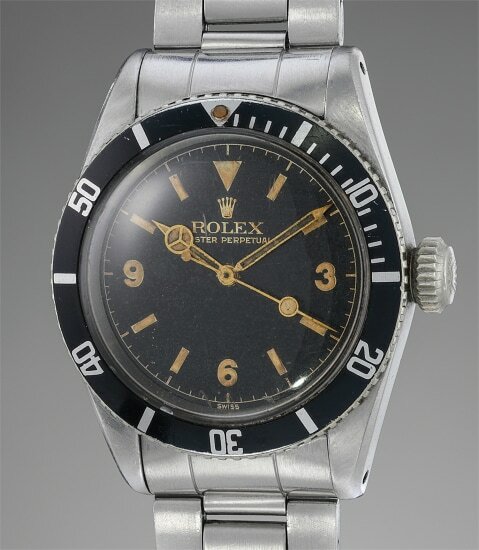 The discovery of a fresh to the market Rolex Submariner reference 6200 from the family of the original owner is always a treat. Introduced at the 1954 Basel Fair, the Submariner was released in three different references. The references 6204 and 6205 were water resistant to a depth of 100 meters and the more robust reference 6200, like the present model, was designed for professional divers, offering water resistance to a depth of 200 meters. These models are nicknamed the “Big Crown”, due to their oversized, 8-millimeter “Brevet” crowns that enabled the model’s cutting edge water resistance. The reference 6200 ticks all the boxes for the passionate collector, a large 37mm case and the highly desirable “Explorer” 3-6-9 dial devoid of depth rating and Submariner signature found in later models. The reference 6200, along with the 6205, were the first models to use the now well-known “Mercedes” style hands. Production numbers were extremely limited and their serial numbers range from 31.9xx to around 32.2xx. The present watch was originally bought by a Scandinavian sailor, captain on different vessels including in the Suez Canal right in the midst of the crisis in 1956. After his passing away the watch laid in a drawer for close to two decades where it was recently rediscovered and is now making its auction debut. The condition of the watch is surprising, the original owner, according to the family, was a dandy and an esthete who took care of his watch even though it was worn on a daily basis. As a result the case retains its strong proportions, with factory original bevels and crisp lines. The gilt glossy dial contrasts strongly with large Arabic numerals that have turned a superb cream color, further underlining the sporty appeal of the watch. The watch was serviced once where the bezel was swapped with the one it is currently mounted on and the bracelet changed. The iconic reference 6200 is one of the most desirable and collectible of all vintage sport watches and finding one fresh to the market and from family of the original owner make the present model a trophy not to be missed. Please note that a period and reference correct bezel (pictured here) is available for purchase by the winning bidder but is not part of this lot.